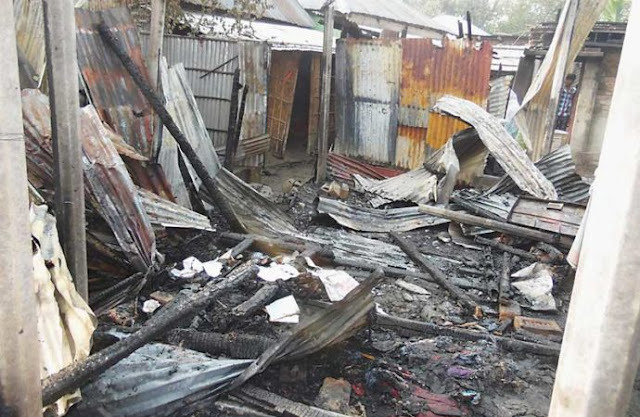 At least 10 houses of the Hindu communities in Bochaganj Harijan Palli of the district were burned to ashes by miscreants led allegedly by a local BNP leader’s son early yesterday. The alleged gang leader, Jewel – son of Bochaganj ward-level BNP leader Aiyub Ali, was caught by the locals while torching the houses. He was later handed over to the police. A case was filed with Bochaganj police by Rubel Basfore against two named including Jewel and four other unnamed people, OC Habibul Haq Prodhan said. Meanwhile, Bochaganj upazila administration yesterday gave each of the affected families 30kg rice, blankets, saree and lungi. UNO Shilabrat Karmakar said that they would distribute cash and tin sheets among the victims. The attack was launched around 3am. Seven houses belonging to the Dalits (sweepers) and three of the local Hindus – situated in railway station area of the municipality – were torched during the attack. Members of the affected families have been living under the open sky as they lost everything in the fire. They claimed that Jewel had masterminded the attack as a sequel to the conflict with some sweepers of the Harijan Palli. Jewel had damaged the Puja pavilion of the Dalit community during the Durga Puja in October. At that time, the locals sought explanation and also demanded compensation from Jewel, triggering a scuffle. The matter later turned into a dispute and Jewel used to threaten arson attack on their houses, the Dalits alleged. Birganj Circle ASP Sujan Sarker said that the local police had been instructed to investigate the allegations. The arson attack has taken place at a time when the religious minority groups including Hindus, Buddhists and indigenous groups are facing persecution at different parts of the country by militants, Islamist groups and political goons.